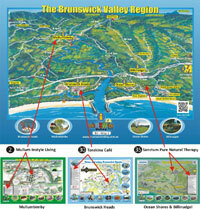 Brunswick Valley NSW, Tourism, Accommodation, business directory, entertainment directory, book holidays, tours and theme parks"
Key: (BH 35) is the town & location number which appears on the town maps. Camp at Mullumbimby Leagues Club for the Byron Bay Blues Festival (Tyagarah Fields), Splendour in the Grass & Falls Festivals (North Byron Parklands at Yelgun) just 10 mins away. Book your accommodation and make use of the shuttle bus to and from the event. Less hassle and much quicker !